Article Template Osteochondritis Dessicans- Primary Fixation using Bioabsorbable Implants. Volume 2 | Issue 2 | JOCR April – June 2012 | Page 3-6 | Galagali A, Rao M.
Dept of Orthopaedic, Manipal Hospital, Bangalore, India. 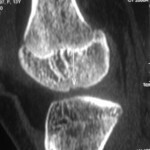 Introduction:Osteochondritis dessicans (OCD) is a localized condition where a section of articular cartilage and underlying subchondral bone separate from the joint surface. It is important to diagnose unstable OCD early and fix the fragments primarily as the results of any surgical management at late presentations are guarded. Use of bioabsorbable implants for fixing OCD is recent and we report one such case in grade IV OCD. 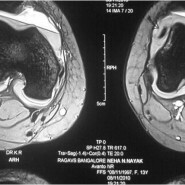 Case Report:We present a 14 year old girl who came with a history of acute pain, swelling, inability to bear weight on the right knee following a dance practice. MRI showed stage IV osteochondral fragment measuring 20x 8mm lying free. This was primarily fixed with bioabsorbable implants. 10 months follow up showed excellent clinical and functional results. Keywords: Osteochondritis Dessicans, bioabsorbable implants, osteochondral fractures, adolescent knee injuries, arthroscopy.